3 leads; Base (B), Collector (C), and Emitter (E). Two main types, PNP and NPN. The base current controls how much collector current can flow. The Base-Emitter “junction” is just like a diode and has a 0.7V drop when forward biased (that is when there is something to supply the current to that junction). Maximum current able to flow between the collector and emitter. Maximum voltage that can be applied to the collector and emitter before current will flow when the transistor is off. Voltage drop from the collector to the emitter. Maximum speed at which the transistor will turn on and off. 3 leads; Gate (G), Drain (D), Source (S). (compared to the BJT, the gate is like the base, the drain is like the collector, and the source is like the emitter). Two main types, P-channel and N-channel. Has a threshold voltage (voltage from gate to source) from 2-4V. The gate voltage controls the amount of drain current that can flow. Maximum current able to flow between the drain and the source. Maximum voltage that can be applied to the drain before current will flow when the transistor is off. Voltage drop from the drain to the source. 1. Amplification – Transistor is used to amplify an electrical signal. 2. 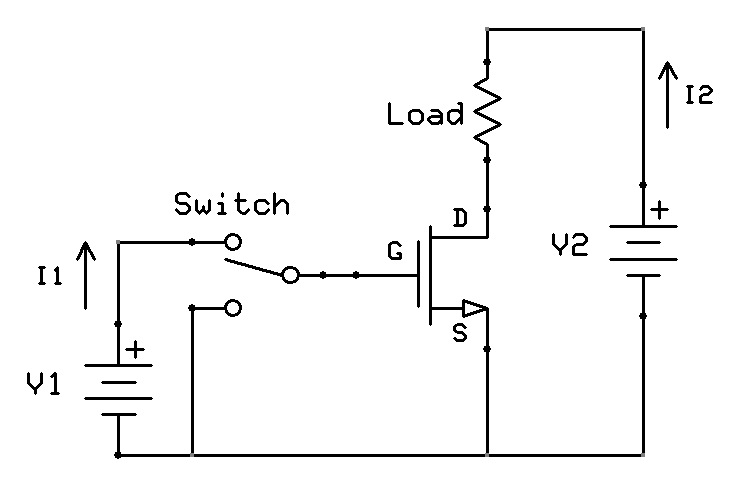 Switch – Transistor is used to turn a circuit on and off electrically. BJT – The Emitter is the lead with an arrow, the Collector is the lead that mirrors the Emitter, and the Base is the remaining lead. MOSFET – The Source is the lead with an arrow, the Drain is the lead that mirrors the Source, and the Gate is the remaining lead. An amplifier is a circuit that takes a voltage signal (typically an AC voltage at multiple frequencies) and multiplies it by a gain to form a new voltage signal. Ideally, the amplifier affects all frequencies equally and all input voltages equally. Because of limitations of the transistor the amplifier will not perform the same above certain frequencies and above certain input voltages. Different transistors will act differently, but herein we will assume that we are operating inside the window if which the transistor will operate as ideal. As an amplifier the transistor has a gain called Beta (β). The relationship is Ic = βIb. That is to say, the current through the collector of the transistor is proportional to the current in the base and is larger by a factor of β. Normal values for β range from 100 to 250. If β=150 and the base current was 10μA then the collector current would be 1.5mA. The BJT can be the center of three common types of amplifiers, the Common Base Amplifier, the Common Emitter Amplifier, and the Common Collector Amplifier. The name comes from the lead of the transistor that is not connected to either the input or output of the amplifier. There are many types of amplifiers but they are typically built around or as a combination of these three types. Let’s look at the “Common Emitter Amplifier” and calculate each piece of the circuit. Example: If Vb = 3V, VBE = 0.7 V, Rb = 100k, Rc = 3k, β = 100, and B = 10Vdc, find the output voltage and plot it alongside the input voltage when Vin is an AC waveform of amplitude 1V. 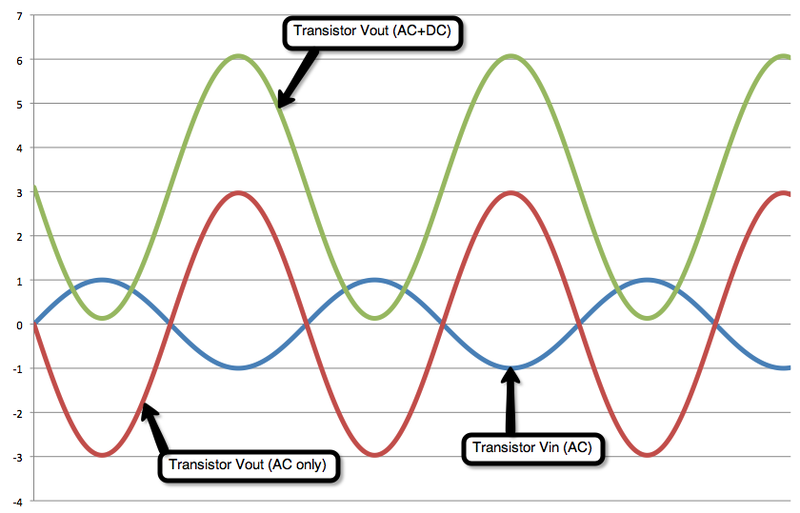 Total output voltage Vout = Vin x Gain + Vc. If the input voltage was an AC waveform with amplitude of 1V the output would be an AC waveform (180 degrees out of phase because of the negative gain) with amplitude of 2.97V and a DC offset of 3.1V. Many times a large current flow in a circuit needs to be turned on and off by using a small amount of current. 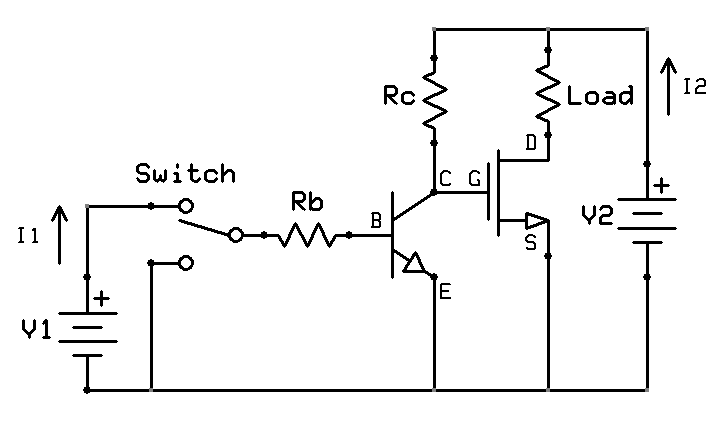 A transistor can function as this switch. 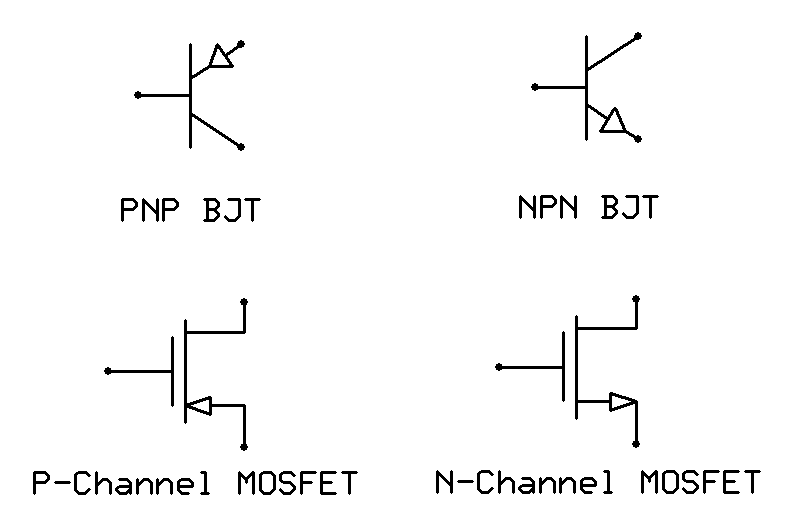 Commonly a MOSFET is used as the transistor however, a BJT can complete the task as well. Below is the circuit that will accomplish this task. In this circuit a small voltage, shown as coming from a power supply V1, is supplying power to the gate of the MOSFET. If this voltage is higher than the MOSFET’s threshold voltage than the MOSFET will “turn on” (allow current to flow through from drain to source). This current only gets to the gate when the switch is connected to V1. When the switch is connected to ground (or the negative side of the power supply) the threshold voltage is not exceeded and the MOSFET is not on and current cannot flow through the transistor. For Example: If in the circuit above the load resistor is 100 ohms, V1 is 5V, and V2 is 25V, find the current in the drain and the power dissipated by the resistor if the voltage drop across the drain to source is 1V. First when the switch is on, the voltage at the gate is greater than 4V so we know that theMOSFET is on and current is able to flow through the drain to source. So KVL says that the voltage around a loop adds to zero or the voltage drops around a loop add up to the voltage source. Therefore, V2=Vds+Vrload or the voltage drop between the drain to the source plus the voltage drop across the load resistor add up to equal the power supply voltage V2. Therefore, we can say that 25=1+Vrload and Vrload=24V. Ohms law says that I=V/R so the current through the resistor is 24/100=0.24A. The power dissipated by the resistor is then P=IV=0.24 x 24 = 5.76W. However, the voltage V1 must be above 4V to insure that the switch will work as the threshold voltage of the MOSFET can range from 2-4V. Sometimes this isn’t possible to insure. For example many microcontrollers (small computers on a chip) supply output voltage of 3.3V and are used to turn on circuits exactly like that above, in place of the switch. Since we cannot guarantee 4V with a 3.3V microcontroller we must use another circuit that employs both the BJT and MOSFET. In this case we have added what looks like a Common Emitter Amplifier without an AC voltage input. Here, if the current through the base of the transistor is zero (that is Rb is connected to ground) then the current through the collector is zero and the voltage drop across the resistor is zero which means that Vc = V2. This causes the MOSFET to turn on as there is a voltage between the gate and the source higher than the threshold voltage. However, if the current through the base is not zero then the current in the collector is not zero and the voltage drop across Rc is equal to V2 and Vc is zero therefore the MOSFET is off. For Example: If Rb=62k ohms, Rc is 13k ohms, β=120, Rload=250 ohms, Vds=2V, V1=1.2V, and V2=22V find Vgs, Ic, and I2. First, the solution for the most part is identical to the method for the BJT amplifier. Start by finding VRb=V1-VBE=1.2-0.7=0.5V. 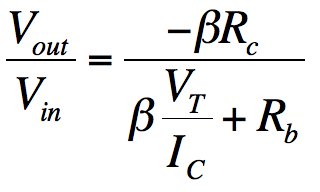 Use ohms law to find the current Ib=VRb/Rb=0.5/62,000=8.06uA and Ic=β x Ib = 120 * 8.06uA = 0.97mA. Vgs= Vc=V2-VRc=V2-(Ic x Rc)=22-(0.00097 x 13,000) = 9.39V. Because of KCL, I2=Irload+Ic=((V2-Vds)/Rload)+Ic=((22-2)/250)+0.00097=80.97mA. 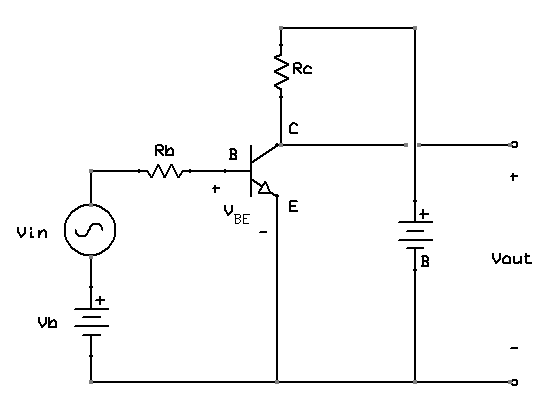 Be careful with this circuit because it operates in reverse logic. If the switch is connected to V1 then the MOSFET is off and I2=0 but when the switch is connected to ground the MOSFET is on and I2>0. The three leads of the BJT are ______________. In the BJT, ______________ controls how much collector current flows. The threshold voltage in a MOSFET ranges from _____________. In the MOSFET, ____________ controls how much drain current can flow. The collector current in a BJT is measured to be 3.4mA and the value of β=125. What is the base current? A common emitter amplifier has a base resistor of 27.2k Ohms and a collector resistor of 3.4k Ohms. β=100, Vb=2V, B=18V, and Vin is an AC waveform with an amplitude of 0.5V. Find Ib, Ic, Vbe, Vc, gain, Vout AC amplitude. A MOSFET is used as a switch with a load resistor of 10 Ohms and the voltage drop from the drain to the source is measured at 0.15V. The current flowing through the drain is 350mA. What is V2? The switch voltage (V1) is only 1V therefore the designer decides to add a BJT into the circuit so that the MOSFET can be switched as discussed in the lecture. The base resistance is 45k Ohms and β=150. What is the minimum value we can select for Rc if V2 is 8V? In a BJT/MOSFET switch circuit V1=2.2V, V2=12V, β=200, Rb=300k Ohms, and Rc=9k Ohms. In the lab the circuit worked but because the gate voltage of the MOSFET is only 3V when this circuit was mass-produced many of the units did not work. What should be changed? The last part of this lecture, Topic 4, is very confusing to understand and the material here doesnt go along with what you are saying very well. An example problem at the end would help a lot. Dave, No problem. I have added two examples on the page. One for the MOSFET switch and one for the MOSFET/BJT switch. Let me know if there are any further questions.